Take Route 9 to Route 33. Proceed East on Route 33 to the third traffic light. Make a left turn onto Route 79, South Street. Make a second right turn onto Jerseyville Avenue. Proceed a mile to the Monmouth County Prosecutor’s Office, which will be on your right. Take Route 18 to Exit 22B – Route 537 West. Proceed West on Route 537 to the second traffic light. Just before the light, take the jughandle for Kozloski Road South and cross over Route 537. Continue on Kozloski Road to the exit for Route 33 West. Proceed West on Route 33 to the first traffic light. Make a right turn onto Kondrup Way. At the stop sign turn left onto Jerseyville Avenue. 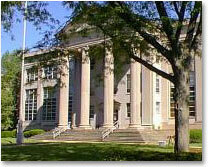 Proceed one block to the Monmouth County Prosecutor’s Office, which will be on your left. Proceed west on Route 33 to the exit for Route 33 Business. Exit onto Route 33 Business West. Proceed west on Route 33 Business to the third traffic light. Make a right turn onto Kondrup Way. At the stop sign turn left onto Jerseyville Avenue. 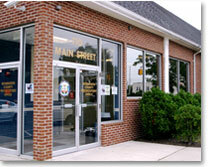 Proceed one block to the Monmouth County Prosecutor’s Office, which will be on your left. Proceed east on Route 33 to the traffic light at Route 79, Freehold. Make a left turn onto South Street (Route 79). Make a second right turn onto Jerseyville Avenue. Proceed a mile to the Monmouth County Prosecutor’s Office, which will be on your right. Take the Garden State Parkway South to Exit 102. Keep to the right on the exit ramp and go under the Parkway; this puts you on Asbury Avenue. Continue east on Asbury Avenue which merges with Route 66 East. When you reach the Asbury circle [the intersection of Route 35 and Route 66], continue east crossing through Route 35 and bear right [back] onto Asbury Avenue. Continue east on Asbury Avenue passing six  traffic lights. At the seventh [7th] traffic light, cross through Main Street and the Asbury Park Satellite Office is on the right [on the southeast corner at the intersection of Asbury Avenue and Main Street]. Take the Garden State Parkway North to Exit 100-B which puts you on Route 33 East. Continue east on Route 33 for approximately 4.5 miles. At the intersection of Route 33 and Route 71 [Main Street], turn left onto Route 71 [Main Street] North. Continue north on Route 71 [Main Street] passing seven  traffic lights. At the eighth [8th] traffic light make a right onto Asbury Avenue and the Asbury Park Satellite Office is on the right [on the southeast corner at the intersection of Main Street and Asbury Avenue]. Take Interstate 195 East to Route 138 East to Route 35 North. Continue north on Route 35 to the intersection of Route 33 [Corlies Avenue]. Turn right onto Route 33 East and continue east to the intersection of Route 71 [Main Street]. Turn left onto Route 71 [Main Street] North and continue north passing seven  traffic lights. At the eighth [8th] traffic light make a right onto Asbury Avenue and the Asbury Park Satellite Office is on the right [on the southeast corner at the intersection of Main Street and Asbury Avenue]. NJ Turnpike North to exit 7A (I-195, Shorepoints). Take Rt. I-195 East to exit 16. Take Rt. 537 East to Freehold. Proceed through and out of the Freehold business district to traffic light – Kozloski Road. Turn right onto Kozloski Road, go 1/4 mile to traffic light and Academy is on the right. NJ Turnpike South to exit 11. As you leave the tollgate stay to the left and get on the Garden State Parkway South to exit 123. Take Rt. 9 South for 7.3 miles, stay left to Rt. 18. Take Rt. 18 South to exit 22B. Take Rt. 537 West just before 2nd traffic light – follow sign for Kozloski Road South. At 2nd traffic light Child Advocacy Center is on the right. GSP North to ramp for exit 105. Follow sign(s) to State Highway 18 northbound. Continue on SH 18 to exit 22B. Off exit 22B take Rt. 537 West. Just before 2nd traffic light – follow sign for Kozloski Road South (CR55). At 2nd traffic light the Child Advocacy Center is on the right (intersection of Kozloski Road and Burlington Road). GSP South to exit 123. Take Rt.#9 South for 7.3 miles, stay left to Rt. 18. Take Rt. 18 South to exit 22B. Take Rt. 537 West just before 2nd traffic light – follow the sign for Kozloski Road South (CR55). At 2nd traffic light the Child Advocacy Center is on the right (intersection of Kozloski Road and Burlington Road). Garden State Parkway South to Exit 123 (about 1 mile past the Raritan Toll Plaza). Take Route 9 South to Throckmorton Street (Route 522). At the end of the ramp, turn left onto Throckmorton Street. Continue to the second left. Turn left onto Avenue C. Continue on Avenue C and you will see the Court House on your right. Garden State Parkway North to Exit 83. Take Route 9 North about 18-20 miles. Make a right turn onto Route 79 (South Street). Stay on this road to the end. At traffic light, bear left, going across Main Street onto Court Street. Three blocks in there is a Y in the road (you will see the Court House). Go right at the Y and just past the Court House is the parking lot. Route 195 East to Route 537 East. Sign indicates to Freehold. Continue on Route 537 until you get to the Borough of Freehold. Route 537 is then West Main Street. Continue to Court Street, which is the location of the Hall of Records. Turn left on Court Street. Three blocks in there is a Y in the road. Bear right. The Court House is on the left. Just past the Court House is the parking lot. A) Route 33 West to South Street (Route 79) in Freehold. Turn right onto South Street into the center of town. At the traffic light bear left, going across Main Street onto Court Street. At the Y in road, bear right, the Court House is on the left. The parking lot is behind Court House. B) Route 537 West into Borough of Freehold. Route 537 becomes East Main Street. Continue to Court Street (the Hall of Records is on the corner). Make a right turn onto Court Street. At the Y in road, bear right, the Court House in on the left. The parking lot is behind the Court House. C) Route 79 South into Borough of Freehold (Route 79 turns into Broadway and, once in Freehold, into East Main Street). At the traffic light in the center of town (the Hall of Records is on the corner) make a right turn onto Court Street. At the Y in road, bear right, the Court House is on the left. The parking lot is behind the Court House.